I have to admit, since my first was a boy, I am all about anything girly for Isla so I am loving the adorable look of the flower dumbbell teether. That and the fact that it is more than just a teether makes it a winning combination. Isla loves that the flower petals crinkle. I would say that is actually her favorite feature of this teether. That and she actually holds it like a dumbbell. I was laughing to myself about how she "works out" with it, then I realized dumbbell is in its name. Nice one Nuby! I really appreciate that the flower dumbbell teether is more a toy with a teether feature built in. That means Isla can get more use out of it than just gnawing on it for comfort. Thus to me, it is better value for the money because it will grow with her. I like that it is small enough to take along with us anywhere, but fun enough that it will actually entertain Isla for more than two seconds. 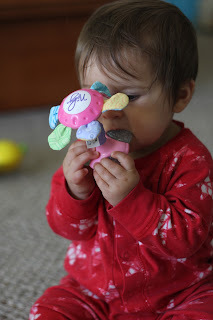 You can purchase the Flower Dumbbell Teether online at www.BuyBabyDirect.com and Target.